Smartphones have great range of uses – a range which is increasing all the time, but occasionally, an unexpected use crops up, and Metal Sniffer – a utility allowing you to locate scraps of metal using just your Android device – certainly falls under that umbrella. Metal detection is usually a hobby taken up by the intrigued few, so while you may not be immediately thrilled by the thought of traipsing around looking for milk caps and whatnot, the fact that it is merely possible is certainly of interest to our geekier side. 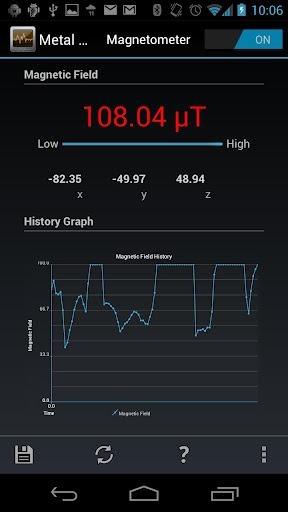 You may be surprised to learn that actually, most Android devices harbor the ability to locate metal, but hitherto, most magnetometer-based apps haven’t reached the heights – many have been left dormant from yesteryear, and are incompatible with the newer versions of Android such as Honeycomb, Gingerbread, and of course, Ice Cream Sandwich. As usual, an XDA forum member has sought to rectify this issue. 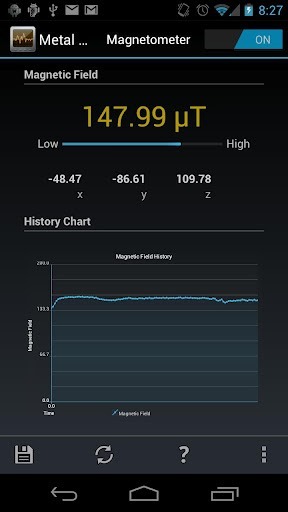 Icechen1 has created an app for Android devices running version 2.3 and up, and unlike the supposedly similar apps on the Google Play Store right now, it’s not limited to ancient software nor is it littered with ads – as the majority of magnetometer apps invariably are. 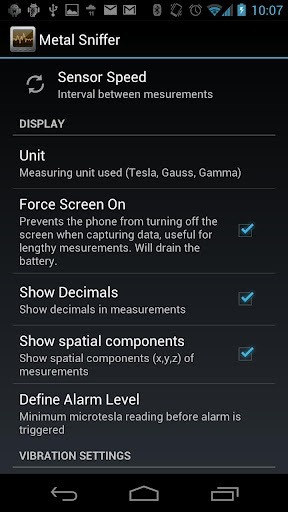 The free, and ad-free metal detector app, offers a slick interface which looks tidy on the 2.3+ devices, and aside from looking good, it also offers a pretty impressive list of features. It will display the field strength in microtesla, milligauss or gamma, and any information you gather can be logged and stored onto a CSV file, which you can export and share, save, or simply keep for your own records. Moreover, Metal Sniffer also works through walls, which is particularly useful if you’re into your home DIY. Most people like to think they can deal with basic home improvements, and with Metal Sniffer installed, you hopefully won’t be drilling rather dangerously through those live wires or hot pipes any time soon! It’s absolutely free of charge, and you can download it right now from the Play Store link below.